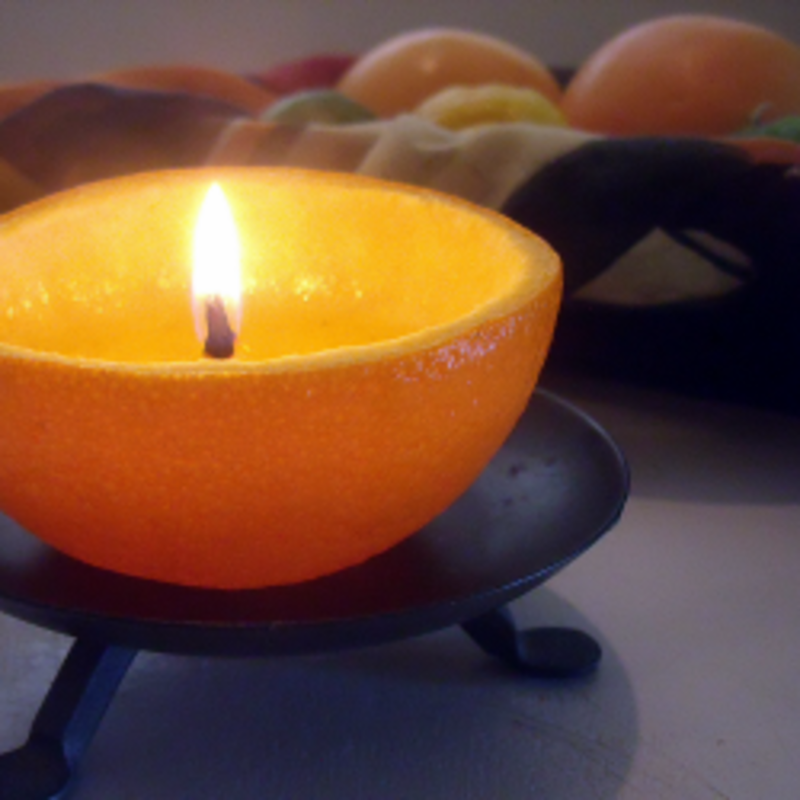 I was so delighted when a friend showed me how to make a candle out of an orange using only a fresh piece of fruit and a little olive oil. They are so simple to make, cost very little, only use natural organic ingredients found in your kitchen and are much healthier and environmentally friendly than most store bought candles. These rustic and homey candles are simply beautiful and the subtle burnt citrus aroma smells amazing. These would be great to use for an outdoor garden party or at a cozy dinner party. 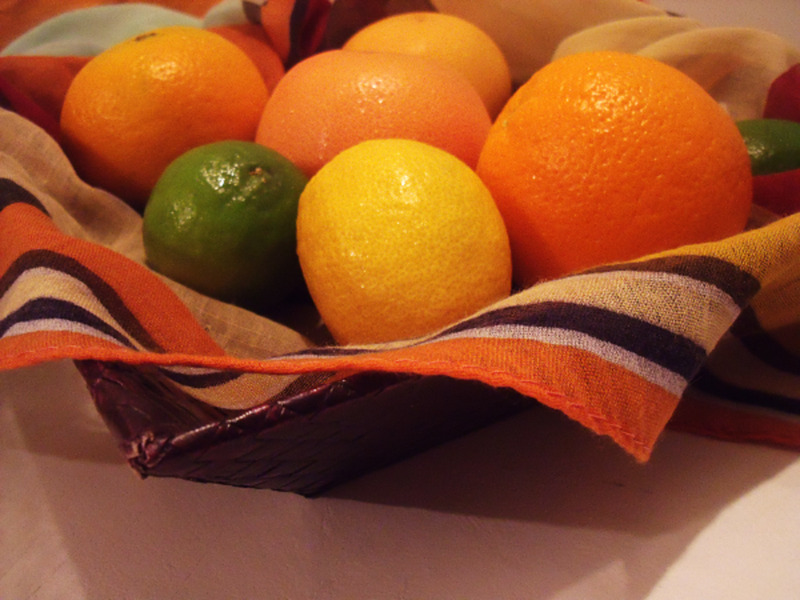 Citrus fruit candles are not only for decorative purposes. Making DIY candles from kitchen ingredients is a life hack everyone should know how to do in case of a power outage or an emergency. 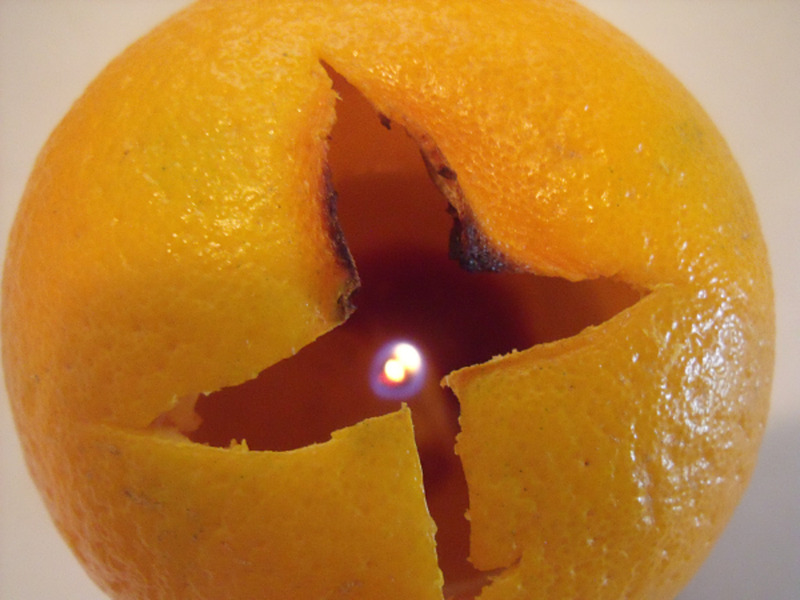 So, grab a piece of your favorite citrus fruit and follow along as I show you how to make a candle out of an orange, grapefruit, lemon or lime. 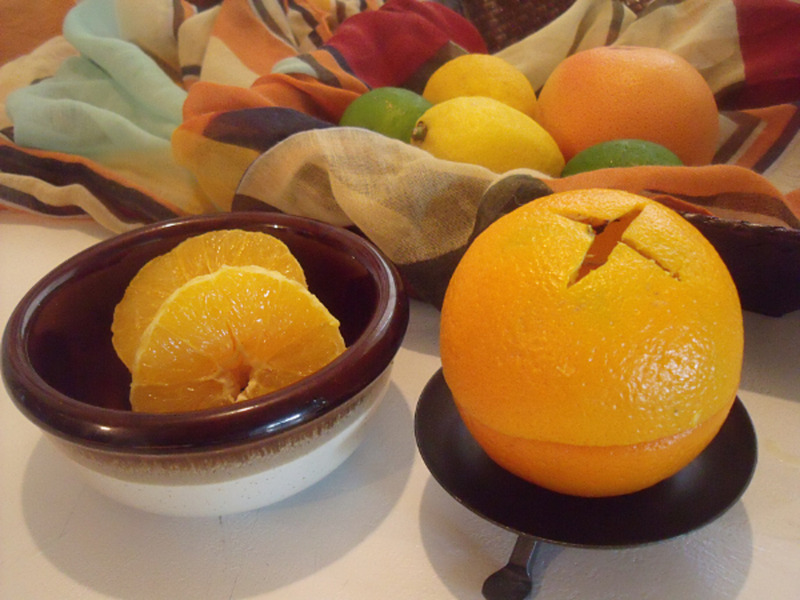 Freshen Up Your Home With The Subtle Aroma Of Citrus Fruit In Just Minutes! Grab An Orange, A Bottle Of Olive Oil And A Book Of Matches! 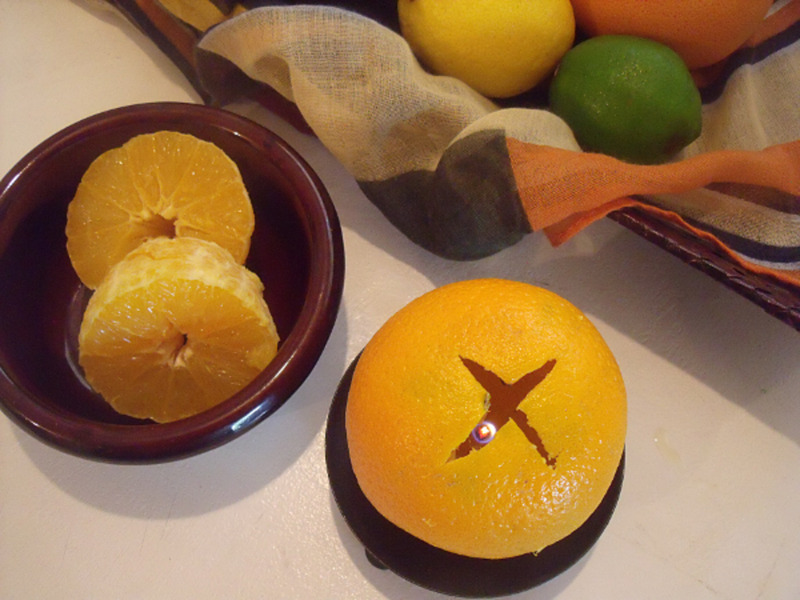 Citrus fruit candles are super easy to make and they only take a couple of minutes to prepare. You will need an orange, grapefruit, lemon or lime and any cooking oil you have stocked in your kitchen. I use olive oil in my candles because I always have a bottle kicking around in my pantry. You will also need a lighter or book of matches to light the wick, a cutting board, a knife and a spoon. Enhance the refreshing and natural smell of the candle by adding a few drops of citrus scented essential oils. Mix and match different oils to create a scent that is unique to your preferences. I love the sweet and exotic floral scent of Ylang Ylang. It smells absolutely amazing blended with a few drops of orange essential oil. I also like the combination of lavender and orange scents blended together. 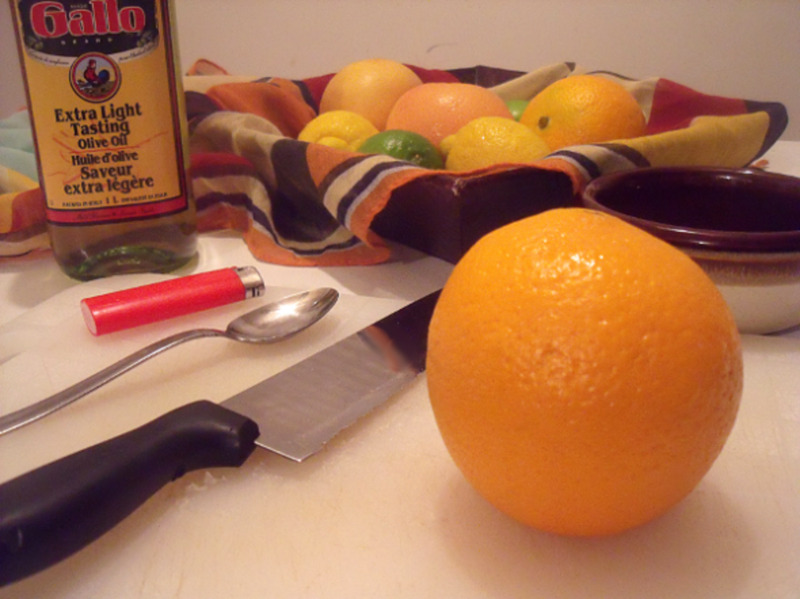 Place the orange or other citrus fruit you are using on a cutting board and cut it in half through the middle. 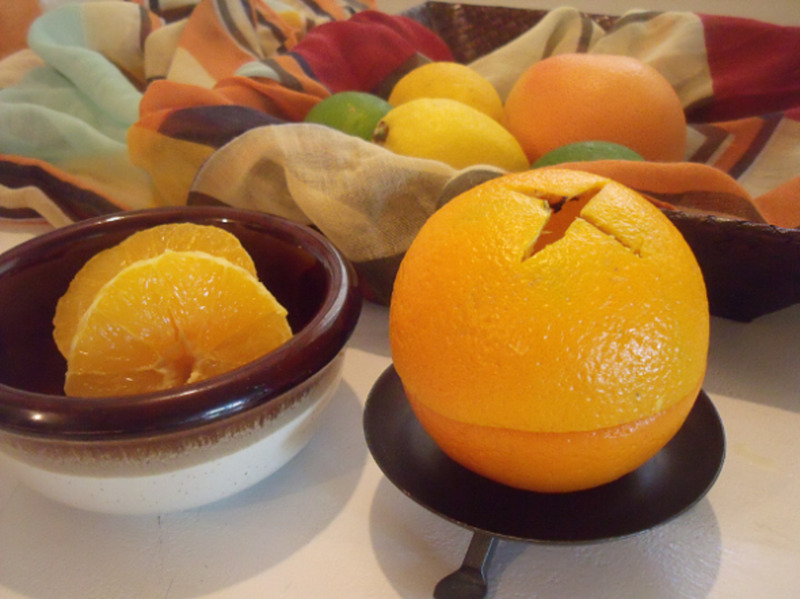 We will be using the top half of the orange to make the bowl of the candle. 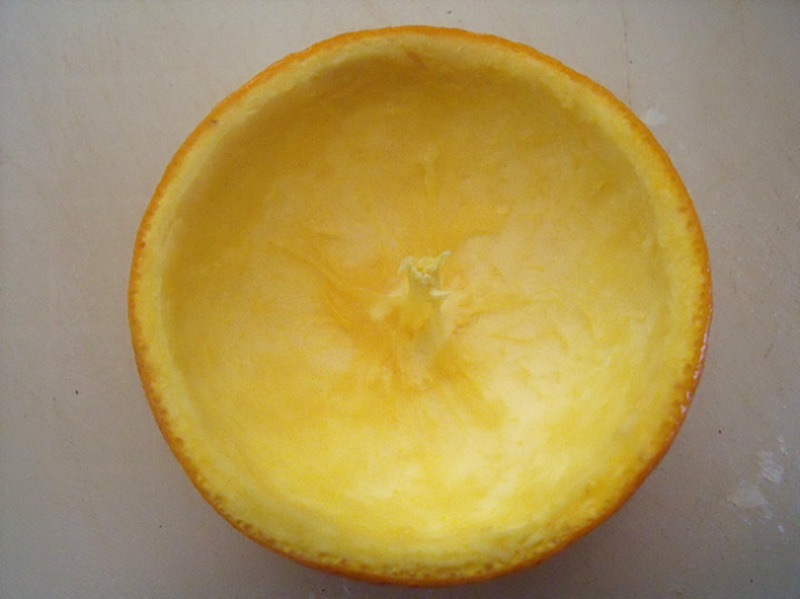 Set aside the bottom half of the orange for later use. 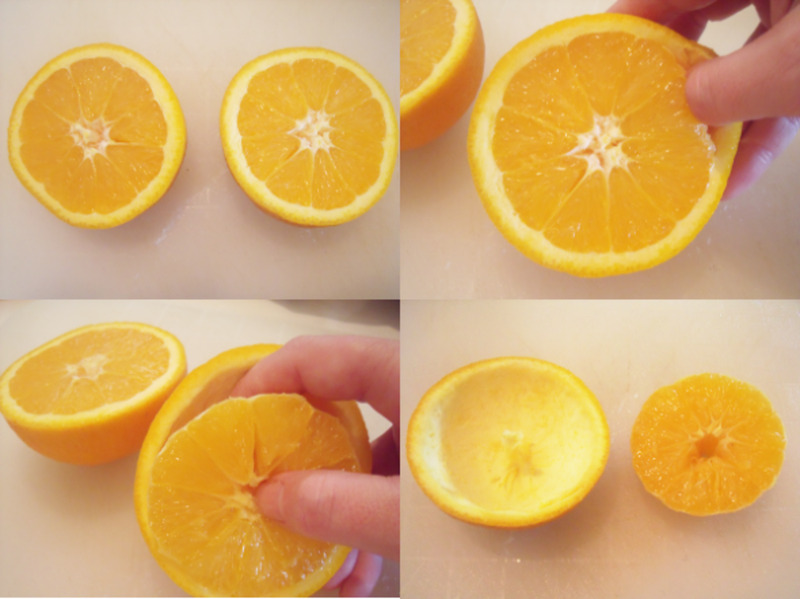 Using your thumb, gently separate the segments of orange from the peel. Being very careful to leave the center stem intact, lift out the orange segments and put them in a bowl for a yummy snack or wrap them up and put them in the fridge for later. You will be left with a beautiful and leak-proof orange peel bowl which has it's own natural "wick" extending upwards from the center. 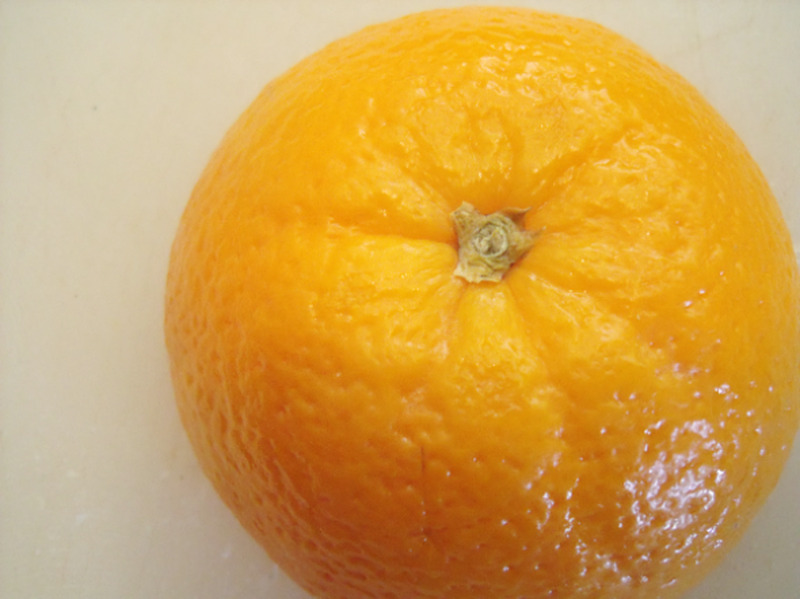 The half of the orange with the "button" on top has a thicker stem and are the easiest side to remove the insides of the orange from. I like to use the bottom half of the oranges for a lid. If you accidentally remove the center white stem, grab another orange and try again! If you are planning on making a lot of these decorative and rustic homemade candles, you may want to serve a fruit salad for dinner or make a jug of fresh orange juice for breakfast. Next, we are going to make a lid. 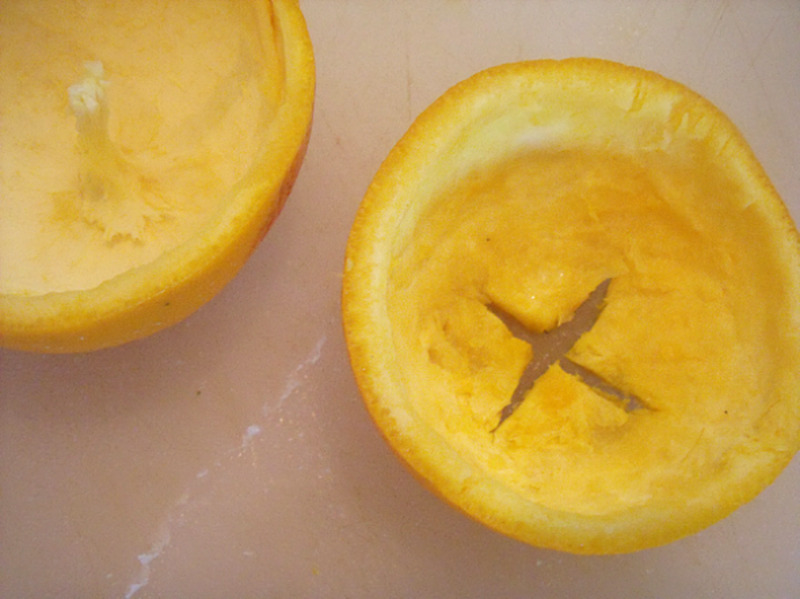 Grab the bottom half of the orange that you set aside at the beginning and hollow it out. Cut a design into the bottom of the hollowed out cup with a knife. Get even more creative and cut out fun shapes using a mini cookie cutter or use a power drill to make lots of little holes in the lid for the candlelight to spill out from. Fill the bowl of the orange three-quarters full with cooking oil. Using a spoon, drizzle the oil over the wick until it is thoroughly soaked. That's it! It couldn't get any simpler than this. 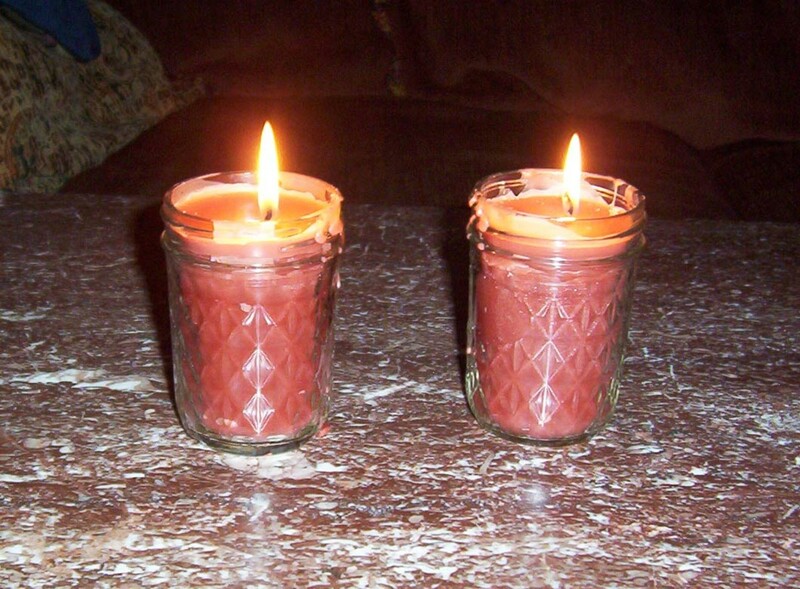 Now all you need to do is grab a pack of matches and light your all natural citrus fruit candle. Sit back and enjoy the delicious aromatic fruity scents as they fill your home with their yumminess and dazzle your friends and family with your crafty ingenuity. 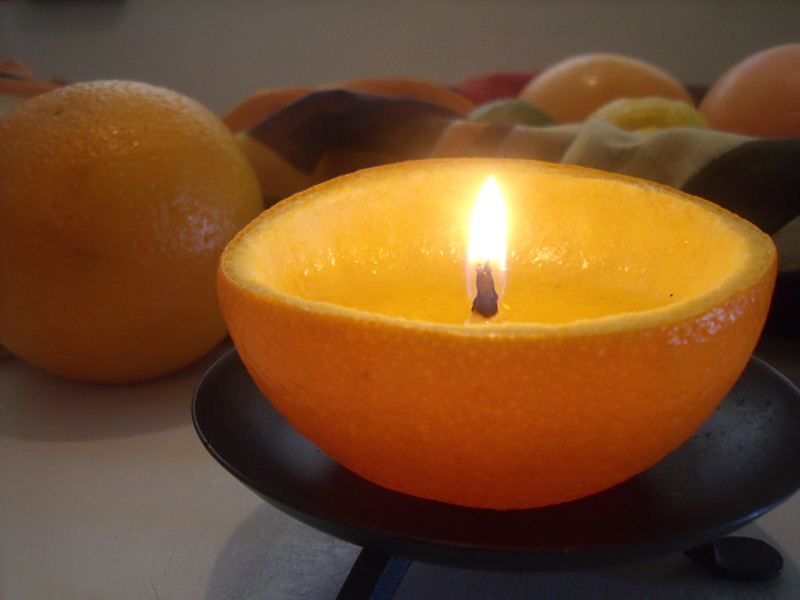 The easiest fruit to use for candle making are oranges and grapefruits. 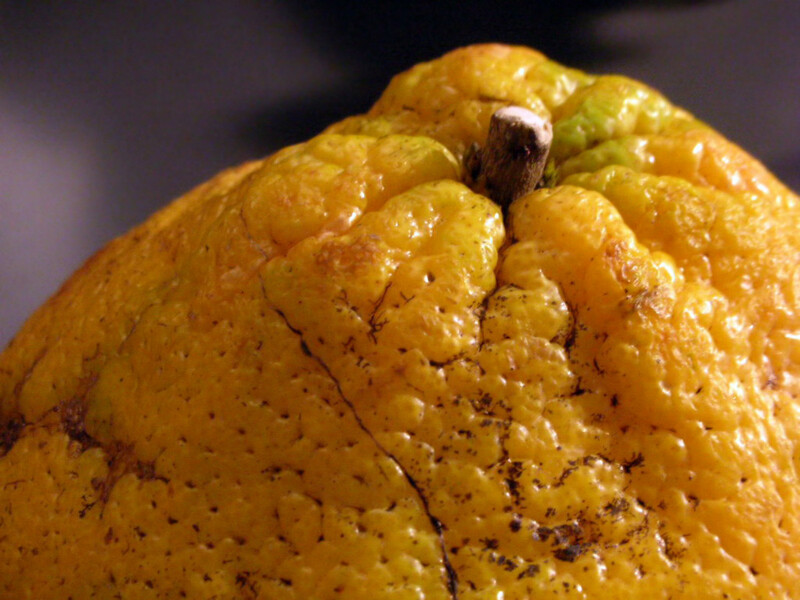 The flesh separates quite easily from the rind and leaves a smooth interior. The different varieties of oranges such as clementines and mandarins have a thinner skin which will give them a more transparent and glowy effect when they are burning. Lemons and lime candles are a little more fiddly to prepare. They have a thicker rind and tougher skins inside the flesh which are not always very easy to remove. I use a spoon to scoop as much of the pulp and juice as possible. They don't have a very thick center stem, so I like to leave a bit of the tough skins in the middle to make a thicker wick. They don't have to be perfect...the fleshy appearance of natural lemon and lime candles invokes a wonderful country home feeling. I blew my natural orange candle out after 8 hours of continuous burning, and that was only because I was going to bed. The candle probably would have kept burning for another 2 or 3 hours. The brown color in the bottom of the bowl is vanilla! The candle burned very clean and did not create any smoke which is evident by the clean interior of the lid. The flame of the candle lightly charred the edges of the cut-out in the lid that left an amazing subtle burnt orange aroma lingering in the air. The bowl of the candle absorbs some of the oils into it's rind, darkening in color and becoming translucent, giving it a glowy effect the longer the candle burns, while remaining firm and leak proof. If your candle does not sit level, use a piece of sticky tac or modelling clay underneath the bowl to prop it up. Balance bumpy and uneven lemons and limes on the rims of small glasses or jars. Wrap the candles up in clear cellophane tied with a bright orange ribbon...add a cute label and a couple of wooden matches for a wonderful homemade gift. Just be sure to tell the recipient to keep the candle in the fridge until they are ready to use and to add a little oil before they light the wick. Download your copy of these free printables. 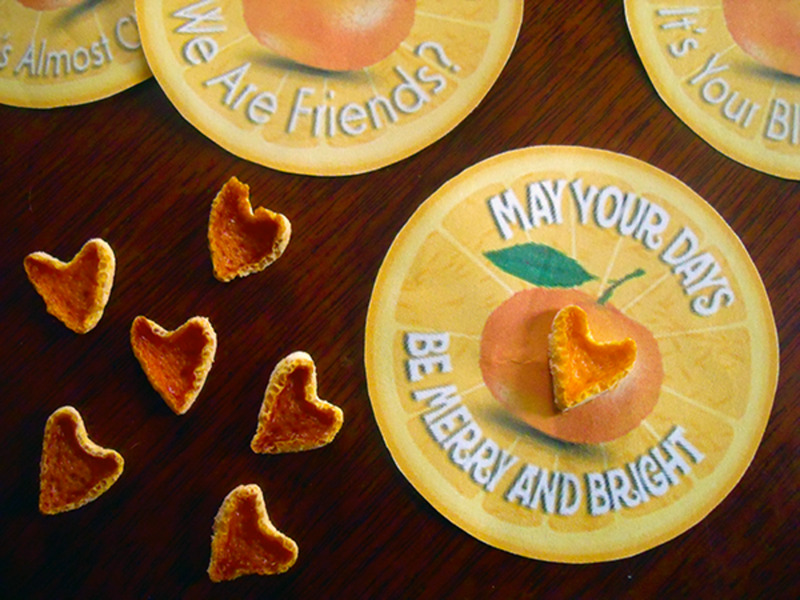 I used a mini heart cutter to cut out heart shapes from the lid of the orange and then I baked the heart shaped peels in the oven to use as embellishments on my gift tags. 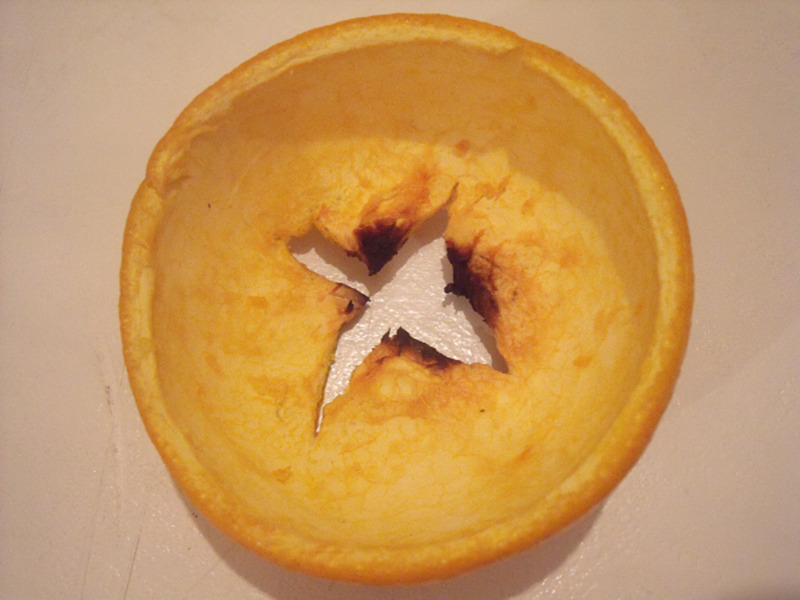 Cut out small shapes from the orange peel and dry in a 250°F oven for 30 minutes. Using a hot glue gun, attach the dried orange peels to the labels or thread a piece of string through them to make natural, handmade gift tags. 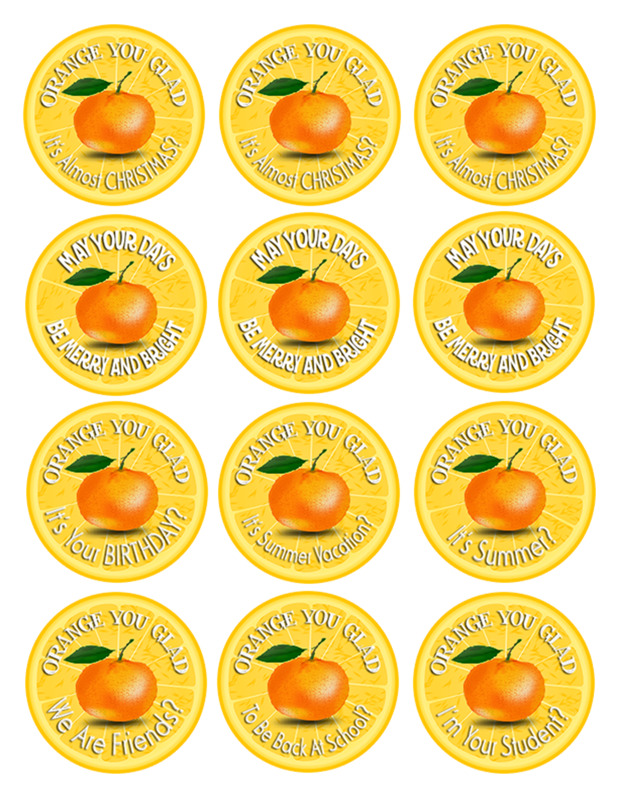 Do You Love Citrus Candles As Much As I Do? These Are My Favorite Citrus Scented Candles! I LOVE citrus scented candles and I keep one in every room of my house. I like to burn an orange and vanilla candle at the same time. The combination of orange and vanilla mixed together smells amazing! Ooh! I love this shabby chic candle. It is the perfect decor for cozy, country homes. I absolutely adore the deep blood orange color of this candle and it smells fantastic too! These make beautiful gifts. Buy one for a gift and keep one for yourself. I keep one of these candles in my kitchen and burn it when I want to freshen up my house. It has a light and pleasant scent that quickly eliminates yucky smells from pets, smoke, dirty laundry, garbage and over-powering foods like onions and garlic. 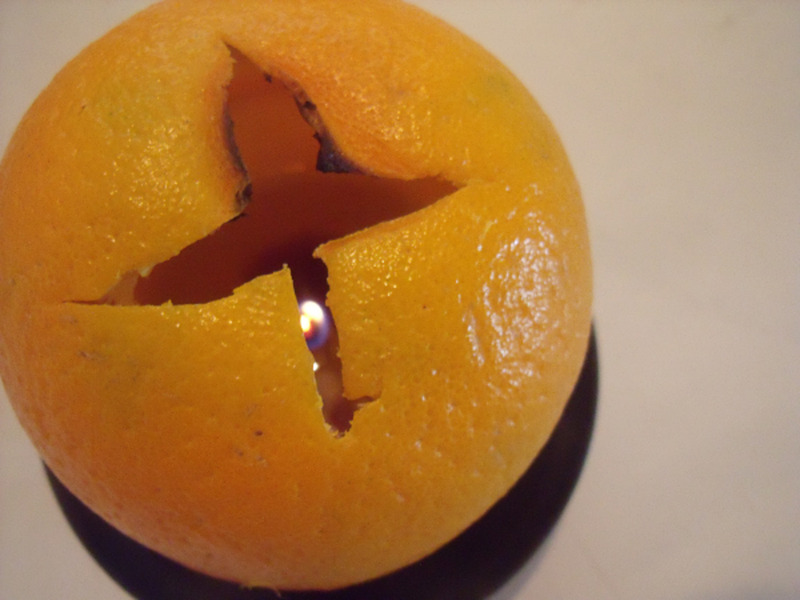 Did you find this tutorial on how to make a candle out of an orange helpful? 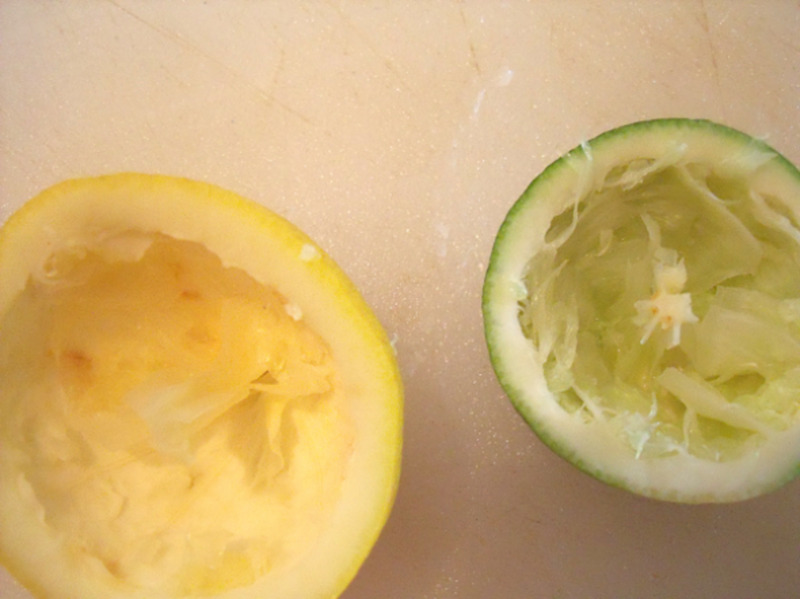 Have You Ever Made A Citrus Candle Before? Great idea, but I can't do it. 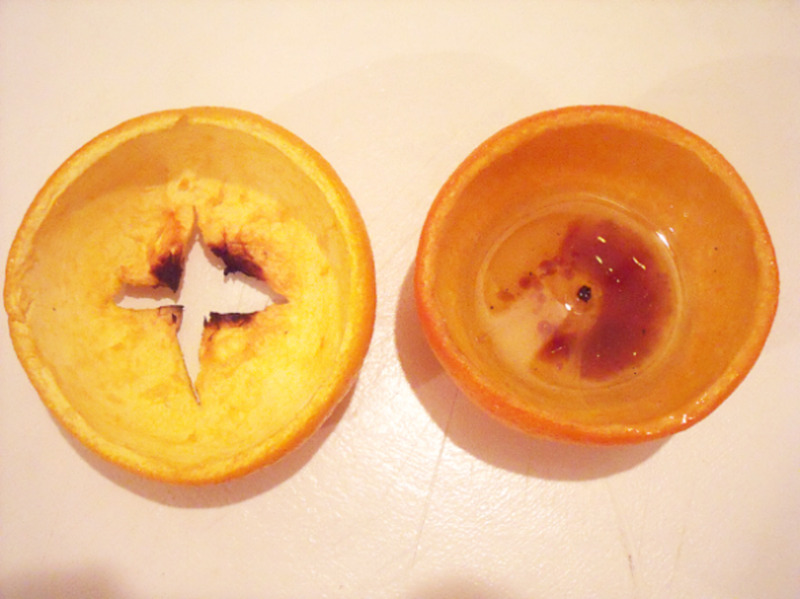 The wick is hard to find, I see it when I first cut the orange, but then I loose it? Love the ideas about using fruit to make candles ,always looking for something unique to decorate with or even using the natural elements fruit and olive oil to make something useful ,I will tell others about this discovery! Going to do this tomorrow. I cant use any form of candles or air freshener due allergies i am so so happy. This is such a smart eco friendly idea that doesnt have any fake bad things in it. :-) So happy right now. Very clever and unique. 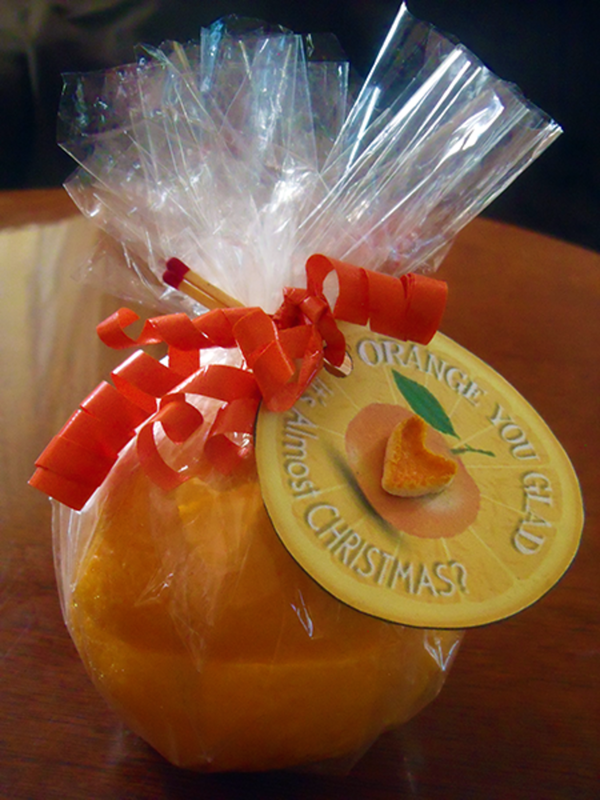 Since we live where oranges are plentiful, sold on every corner, this is a great idea for gifts. Thanks! No, but I could almost smell these while reading this. Have to book this one for sure. What a great idea and I can just imagine how good they smell too. This is such a useful thing to know. I have never heard of this before. I have a grapefruit and some olive oil in the kitchen. I am going to be trying this very soon! Thank you for this delightful lens! Wow! This is amazing. I love a citrusy scent and definitely try your idea. This is such a wonderful idea. Definitely on my to do list. I am willing to bet these smell fantastic! Nice lens! No I haven't, but now I want to! A very cool idea. Linked to my "Indoor Citrus Trees" lens. Very interesting! 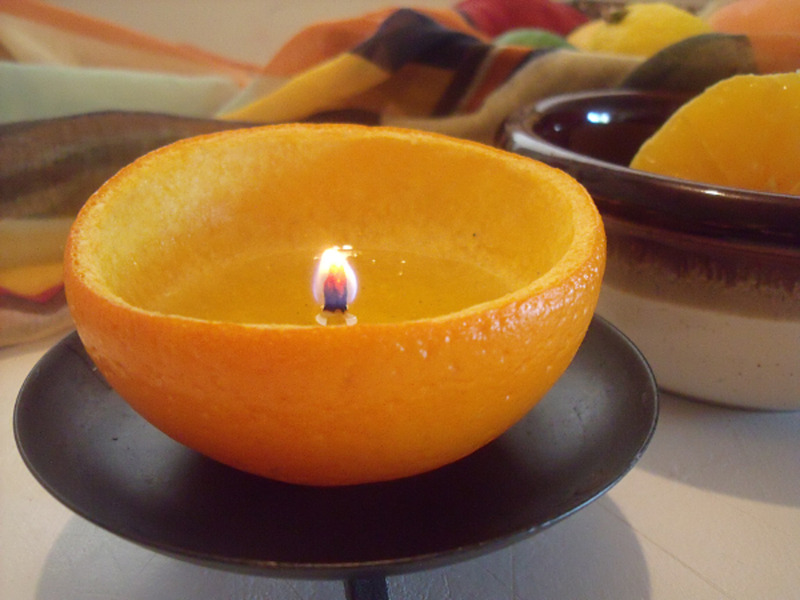 I never thought of making a candle with citrus fruit. Thanks for the idea. I love a citrusy scent! Wow. This is amazing! I am really going to use this. I actually have an allergic reaction to most synthetic scents in candles, so I never get to use them around my home. I love this idea, and I can't wait to try it out! Thank you so much! 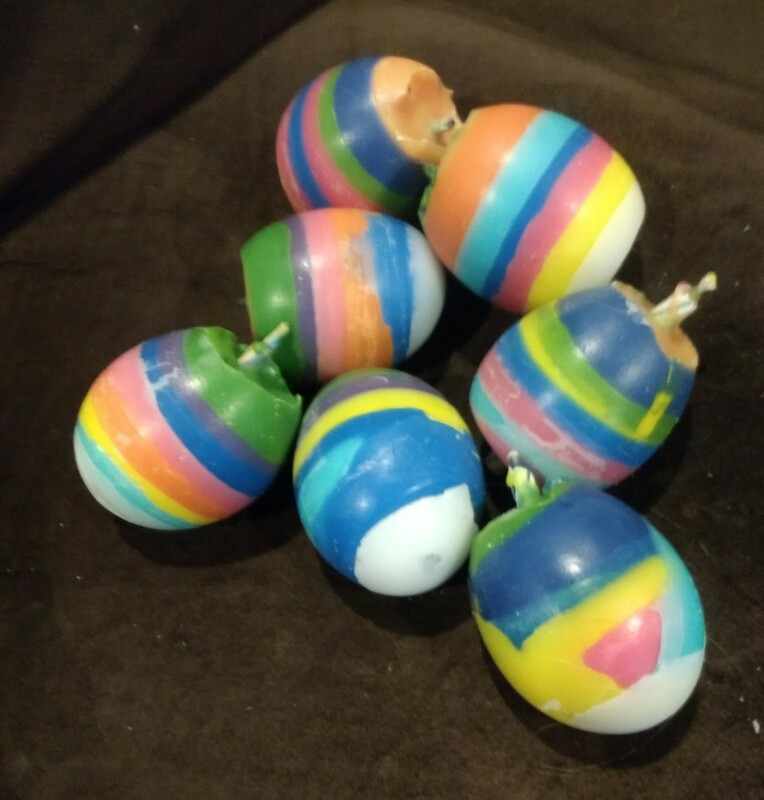 i just got into making candles. I love this idea. I am trying this tonight. Thanks. I just made one of these last week, only I didn't make the lid for it. I was surprised how well it worked. What a great lens! I love the photographs. I saw the instructions for these a few years ago on the Apartment Therapy site but you explained it SO much better. I must try this soon with our lovely Florida oranges. I love the idea of using essential oils too. My favorites are sandalwood and patchouli and I'm not sure how well they would blend with the citrus but it's worth a try. Thank you! I like Fruit Candles, the good idea for drinking. mmmm...I can almost smell it from here...nicely done. I have never done this - but I will. Pinned to both my "thrifty living" and "crafts I love" board. These natural citrus candles look great! I think this can be a perfect gift for people who like nature. I would never have thought of this on my own. Fabulous idea and such an easy project. I will definitely try it. What's not to love about an all natural candle? Thanks! It is all about creativity. Nicely done. Fabulous! I love almost anything with a citrus scent. Shared via Pinterest. I love these! I have never made one before, but I plan to. Looks like fun! I'll have to try this with my kids. ... wow luv the idea... a must try! This is something I am definitely going to try... and right now, in fact. I have a couple of spare oranges that need eaten already. wow i love oranges and i used to eat much .... but from now i can utilize the peels even whoaa ! That's a really cool idea, I might have to give it a try. This is great idea , thank you . i'm eager to make some of these. I like everything about them. Oh wow, this is an amazing idea. Now I want to have a dinner party so that I can use this. So creative. Great lens! This is a great idea, very nice looking and surely a nice smell. Congratulations. Never made one, and this looks like a great project. Thank you for publishing this lens. This is so great! Can't wait to try it! Thanks! I would never have thought of doing this. I would have thought the orange would go up in flames but now I'm going to give it a try. This is so cool! I can't wait to try it. Thanks! What a fantastic idea. I can see so many uses for this. And oh, the aroma! This is nice to know, we can still use orange peel in other useful thing. No, I've never thought of this before. Thanks for the amazing idea. Wonderful idea and great instructions. Thank you. I am hoping the mosquitoes will hate the lovely citrus smell this summer! Wahh .. this is interesting . Worth trying some day . Thanks for sharing this idea . No but it looks like a really easy thing to do. They'd be great for Xmas. Everyone loves the smell of citrus, but who knew you could make cameras out of it! What a great idea. I don't think I will ever buy a candle again. Never occurred to me this could be done. How simple, and different. Great idea as party props around a dinner table. I have to try this! Well worth a purple star. A GREAT idea for those of us in Florida. This is so cool. This is a great idea, thanks for sharing! I made a candle today out of grapefruit. I love how it glows &amp; how terrific it smells. Congrats on your well deserved raffle ticket. Lovely and cheap way to make a candle. This is adorable. I never would have thought of using portions of the fruit for the wick. Very cool. What? Are you serious? You only need cooking oil and an orange, it even has its own natural wick? This is so cool. I think I may try it. 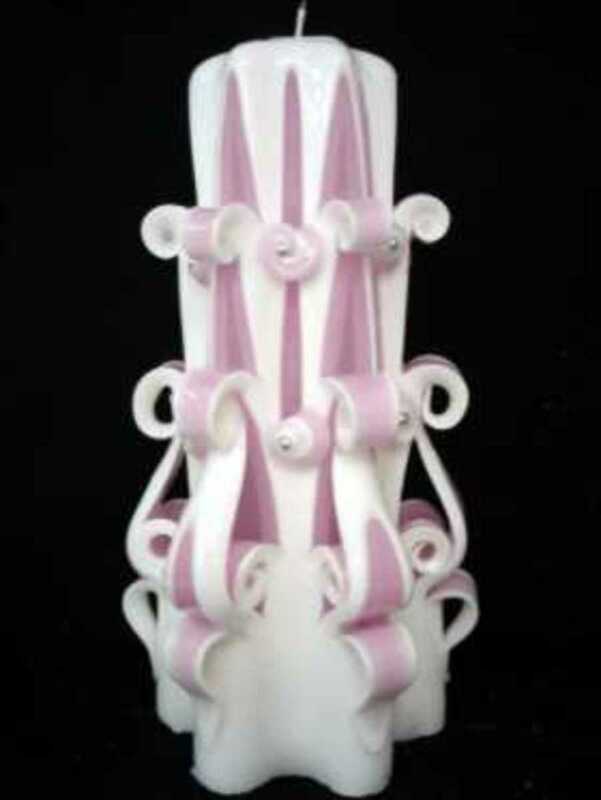 I did make this candle and loved it. I love this! 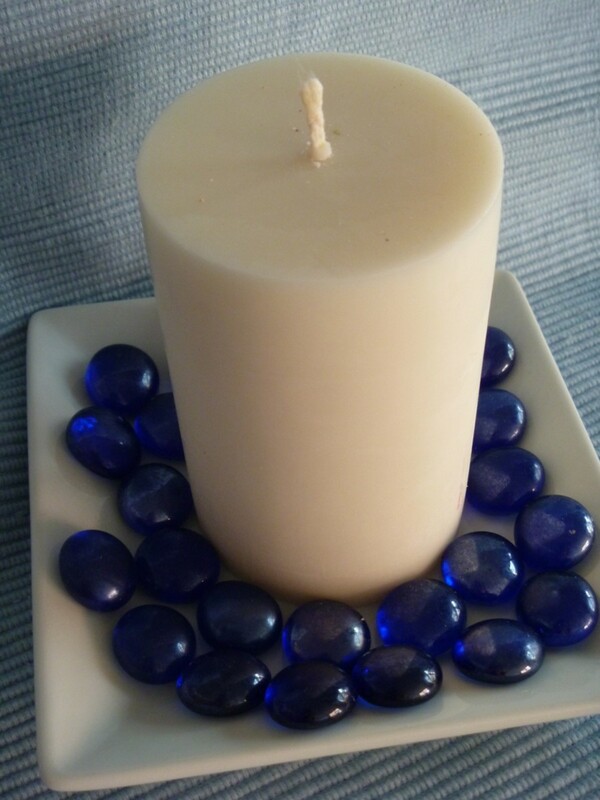 Great tip for making candles - I'll have to try it too! This is amazing! I have this on my things to do list, too. Pinned and set.. Congrats on your Purple Star and feature Corrinna! I'm definitely trying this as soon as possible! think I'm going to try this! Wow, I had never heard of doing this before but I love the idea! I love the smell of citrus, especially during the summer. Wonderful! I am going to try this as soon as I can! Great idea. I'm going to give it a try. Brilliant! No, I've never made a citrus candle. But I have an orange on hand . . . Congratulations on winning the Imminent Challenge this week! This is so interesting, love the idea! A great alternative to candles if we have a hurricane again. We close to ran out the last time. My husband has tried string and a small cup with olive oil in it and it worked, but this is so much prettier and more interesting. Will share this with him. Beautiful photos! I so enjoy the scent of citrus and enjoy candlelight so I will surely have to use your instructions for making myself some fruit candles. Thank you for providing such great step-by-step instructions on how to make them! 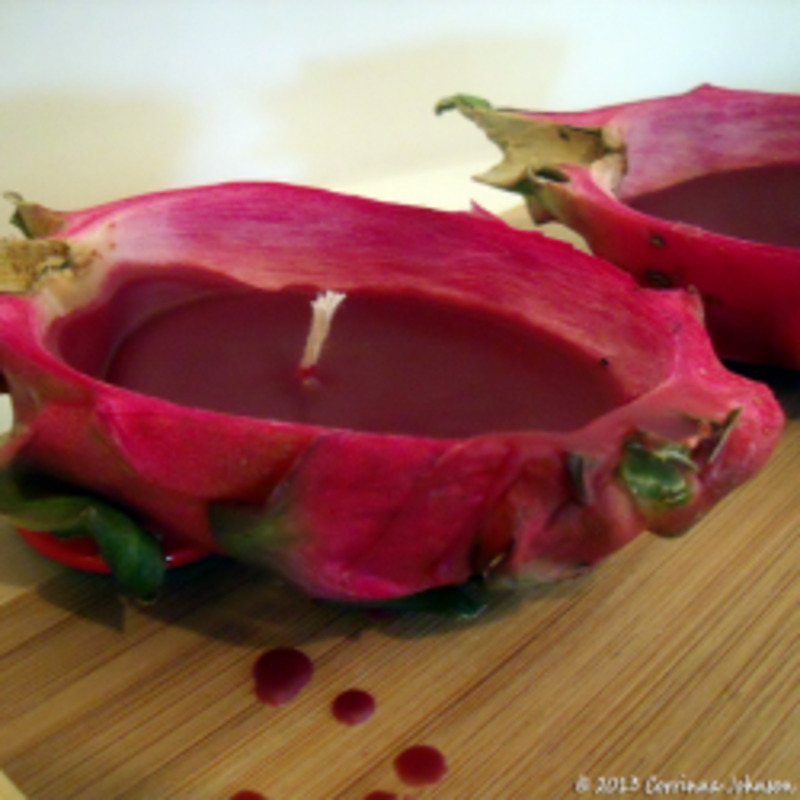 I couldn't help thinking what a healthy way to light up the day - using edible fruit to make these naturally scented candles! Cool idea!!! Thanks for sharing. I m gonna try it. Awesome creativity. I really appreciate your work. Someone posted something about this same method of candle making on my facebook wall last night... it's taken me the last half hour to figure out where else I'd seen it! You have taken some really great photos here. I imagine these candles must smell glorious!!! I love the smell of citrus in the house. Orange is one of my favorite fruits. No I haven't, but what a fantastic idea. Such a neat idea! Can't wait to try for an outdoor party! 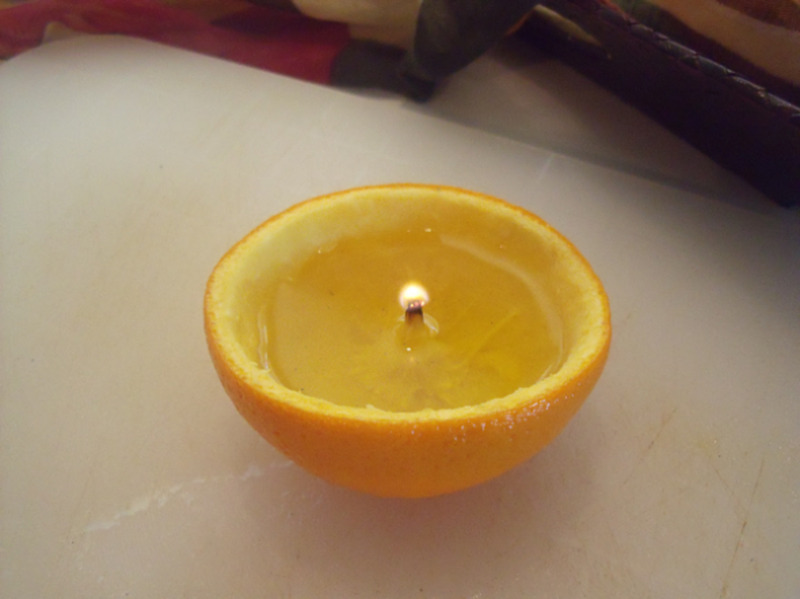 I have been thinking about making a citrus candle after someone shared a similar project on Facebook. Thanks for the great photo tutorial. What a great idea. Something I intend to try.